There is a plethora of confusing word pairs in English, and even native English speakers confuse their usage in everyday conversation. Earlier today, for some reason, I kept hearing Snow Patrol’s Chasing Cars in my head. ((Snow Patrol’s web site)) I used to listen to this song a lot, so I guess the fact that I felt like lying down for a few minutes more triggered memories. In any case, I was thinking to myself, should it be lay or lie? That simple question resulted in more than a few minutes of lying in bed and mulling the two words over. So what’s the deal? 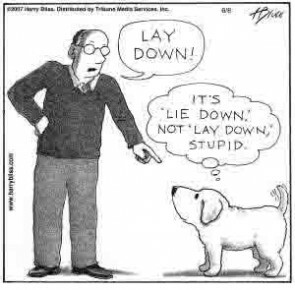 Lay and lie are easily two of the trickiest words in the English language. The chances are that you have had at least one experience which shows just how arbitrarily people seem to use them. I have a friend who has spoken English all his life and yet always says “I need to lay down”. What’s wrong with that? Simple enough, isn’t it? That’s the easy part, actually. Both examples are in the simple present tense, and it is not that hard to remember how to use the two words. Here comes the fun part – using lay and lie in the past tense. The past tense of lie is lay. The past tense of lay is laid. Let’s kick things up a notch and throw in the past participle as well. Lie then becomes (has/have) lain, while lay becomes (has/have) laid. You do not even have to imagine what a jumbled mess it can be with lay, laid, and lain thrown into the pot! So how do you remember? Here’s a table that simplifies things. Here are a few more example just to make the verbs stick. The water buffalo lay in the mud for four hours. She has lain on the lounge for longer than she should have! Remember, there is no object needed for lie-lay-lain! For lay-laid-laid, we need a receiver of the action. 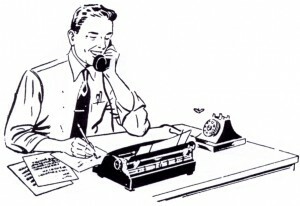 The writer laid his pen down for the nth time. The waiter has laid the tray down countless times tonight. Personally, I find it most confusing when I use lay. Sometimes, I even have to stop and think to make sure that I am using the word properly. Practice makes perfect, though. After a while of being sure of the right usage, you won’t have to think twice about it.